After a few days in Cusco we traded the city for the rainforest and a tree house break. First we took a flight to Iquitos in the North of Peru. We were met at the airport by Marden our guide and jungle expert for the duration of our stay in our rainforest tree house. 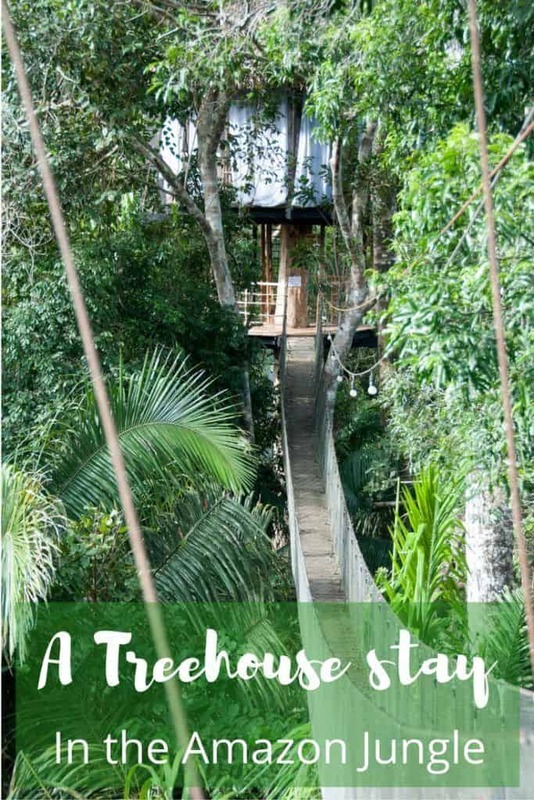 Treehouse Lodge lies on the banks of the Yarapa River deep in the Peruvian Amazon and getting there is an adventure in itself. 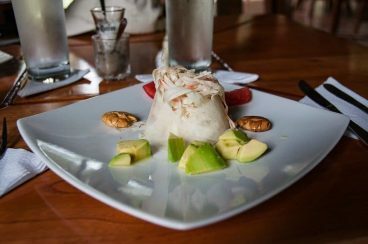 It’s 1.5 hours by road from Iquitos to the port of Nauta. Here The Treehouse Lodge boat was waiting for us to start the hour long journey up the Marañón River. The wildlife spotting starts before we even reached our rainforest tree house. At the point where the Marañón meets the Amazon we slow down and spot glimpses of pink and grey river dolphins in the water. 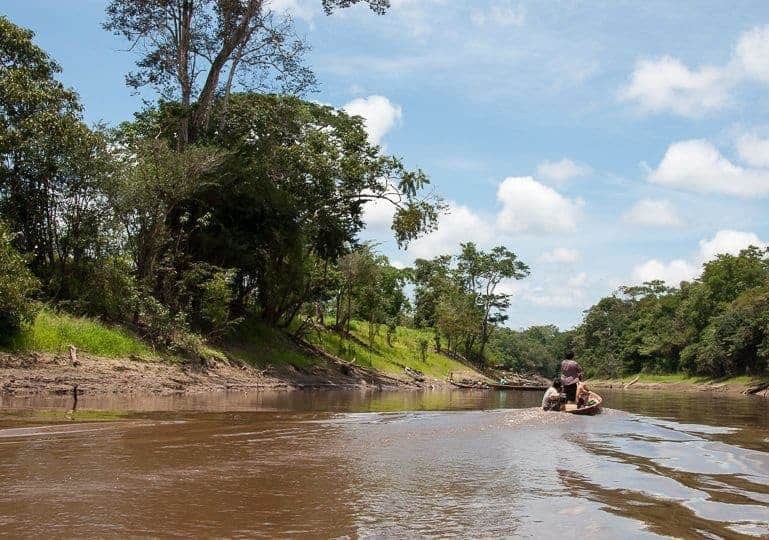 But it’s getting dark so we continue onto the Ucayali River and finally connect with the Yarapa River. As we disembark we can see the lights of our tree house resort glowing through the trees. We make our way along the wooden walkway to the lodge’s communal area, fireflies dancing in the darkness. We’re welcomed by Edwin, the lodge manager who hands us a welcome glass of refreshing passion fruit juice. After a delicious meal it’s time to check out our luxury tree house and I can’t wait to see it. The tree house designs are all slightly different. We’re in treehouse number 7 ‘Solitude’. 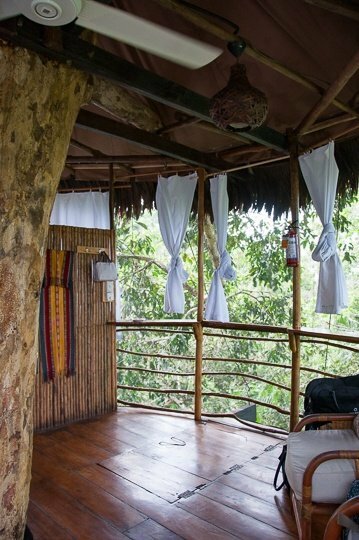 It’s the furthest out into the jungle and very secluded – we’re the only guests at the lodge that night and when we get to our tree house it really feels like it’s just us, the jungle and our very cool tree house. As soon as we go outside the night time sounds of the jungle envelop us in a cacophony of cicadas, croaks and caws – it’s deafening! We follow the signs on the walkway and after a few minutes we come to a towering tree with a wooden staircase winding around it’s trunk which climbs up into the blackness. We climb 84 steps (yes I counted) and reach a platform where we stop for a well-earned breather. After three days our fitness levels improved massively! Next, a hanging bridge takes us to another platform and then a longer suspended bridge leads us, finally, to our treehouse. Up a few more steps, through a trap-hatch and we’re in. Him and me up a tree in the Amazon Jungle. The stuff of adventures. 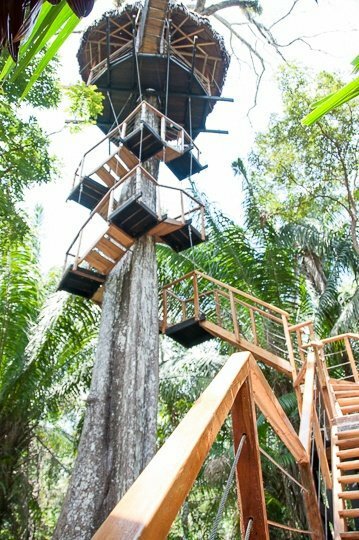 There were ten luxury tree houses at our tree house resort and, at 67 feet high in the canopy, ‘Solitude’ is the highest. The tree house designs are all different depending on the structure of the tree they’re built into. They are reached by a network of wooden walkways, steps and hanging bridges and are completely private although some are closer together for friends and families. The lodges are screened all round so that insects and wildlife can’t get in but they’re barely noticeable and don’t impact on the view at all. 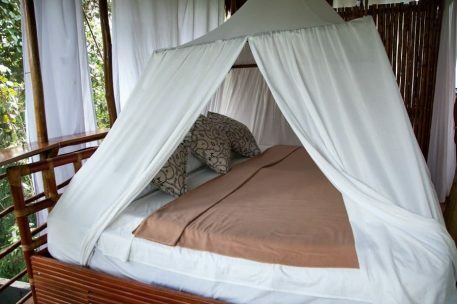 In our tree house resort we had a double bed with fresh, white linen and clean towels. There’s a comfy seating area with chairs and a sofa – great for curling up in whilst watching for wildlife in the canopy. The breeze from the ceiling fan was welcome in the heat. We had an electric light although we tried not to use it too much in the evenings as it attracts the bugs. A safe, first-aid kit, fire extinguisher and walkie talkies to contact the main lodge are all provided. Mobile signals are flaky this far into the jungle. (Tip – it’s pitch black once the lights go out so a head torch is invaluable in the jungle). 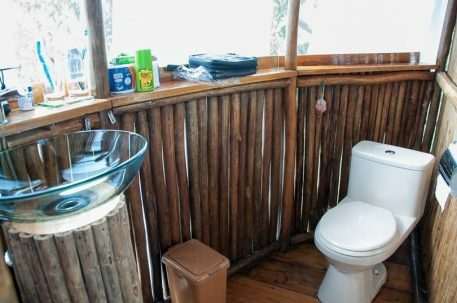 The bathroom area is sectioned off behind a bamboo wall. Behind it we were surprised to find a proper ceramic flushing toilet and a stylish glass hand basin. The shower stall is supplied with cold water. There’s nothing better when you come back hot and sticky from a jungle excursion than a cool shower. The bed has a mosquito net so any bugs that may have sneaked in when we opened the trap hatch didn’t get to feast on our flesh. Mosquitos were one of the things that worried me about going to the jungle because I get a nasty reaction to bites. And then there’s the whole Zika thing. The nice people at Ellis Brigham put my mind at rest by supplying me with some anti-mosquito clothing. The gear worked brilliantly because I didn’t get bitten once whilst in the jungle. Except by the adventure bug. 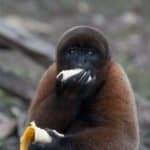 We settled down for our first night in the Amazon jungle and lay listening to the strange and unfamiliar noises, wondering what was out there and how close it really was. I didn’t wonder for long and was soon fast asleep, in fact, I slept soundly every night. Jungle life is pretty tiring. 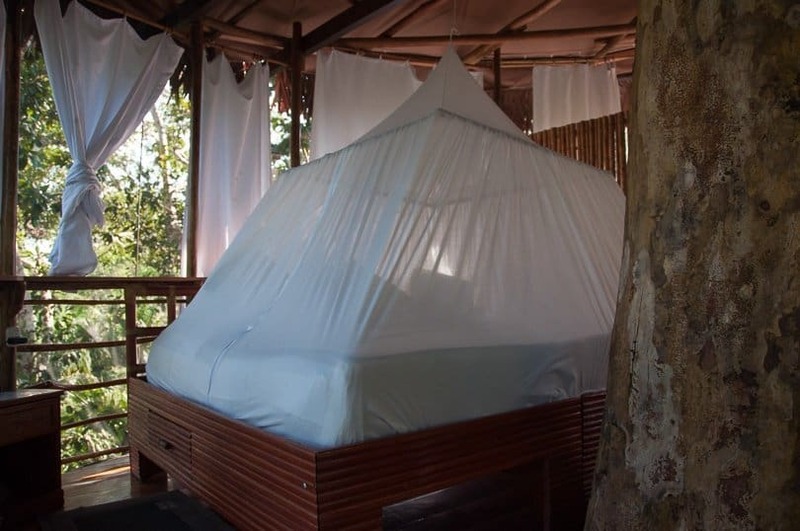 Waking up in the tree canopy of the Amazon Jungle is an amazing experience. As the sun rose each day a golden light filtered through the treetop canopy that surrounded our tree house. We’d lay and listen as the night shift cacophony clocked off and the day-shift took over. Birds would fly past and we’d hear monkeys crashing through the trees. One even landed on the treehouse roof and proceeded to throw dead leaves down – good of him to tidy up! You’re going to come across a few bugs and critters in the jungle. It’s all part of the experience and the wildlife is one of the reasons we went. One morning we spotted a huge, hairy, red-toed tarantula on our way to breakfast. Nice pedicure… Most of the creatures prefer to stay away from humans but we did see a small mammal near our treehouse with big round ears and eyes. We never did find out what it was but it looked quite cute. There were birds in the trees all around our treehouse but the excursions held the main wildlife spotting opportunities. Solar panels power all the electrical needs of the tree house resort from lighting and fans to refrigeration and communication. A generator is used only on overcast days as a back-up. Fresh drinking and cooking water is brought into the lodge but the rest of the water is pulled from the river. It’s purified multiple times before being used for showers, toilets, sinks and cleaning. 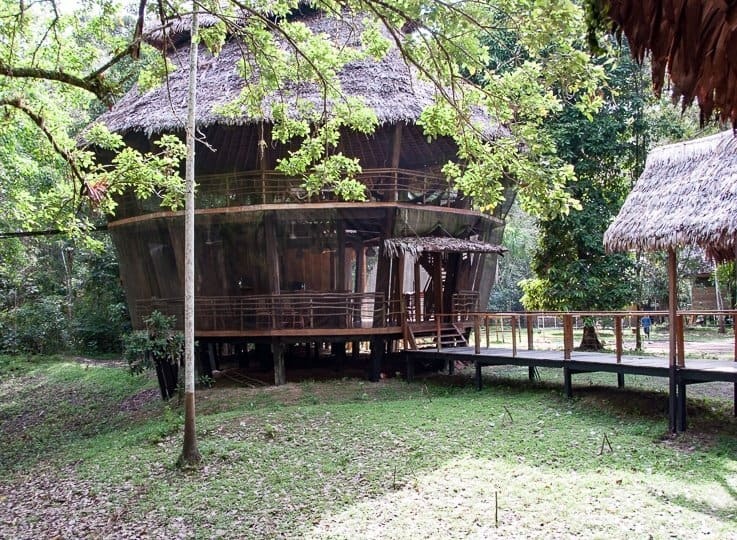 Each treehouse was built by hand without using heavy plant machinery. 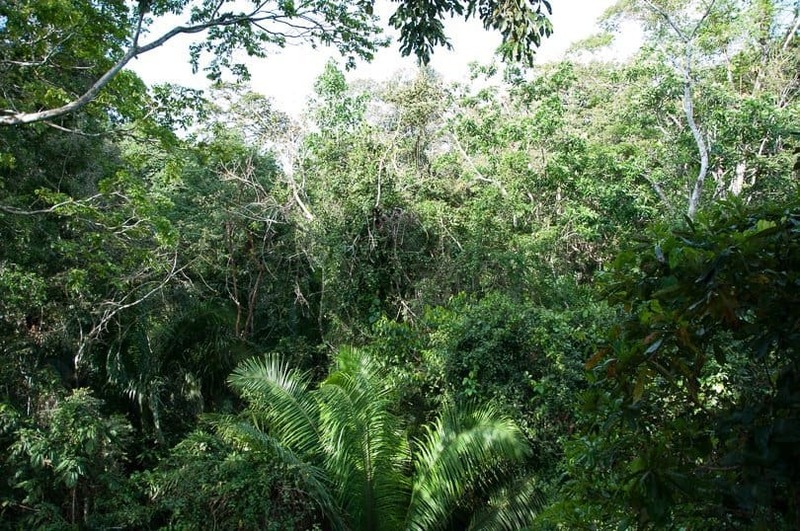 This left a minimal impact on the jungle with efforts made to preserve every plant and tree. Talented chef, Sterling, served three excellent meals a day. 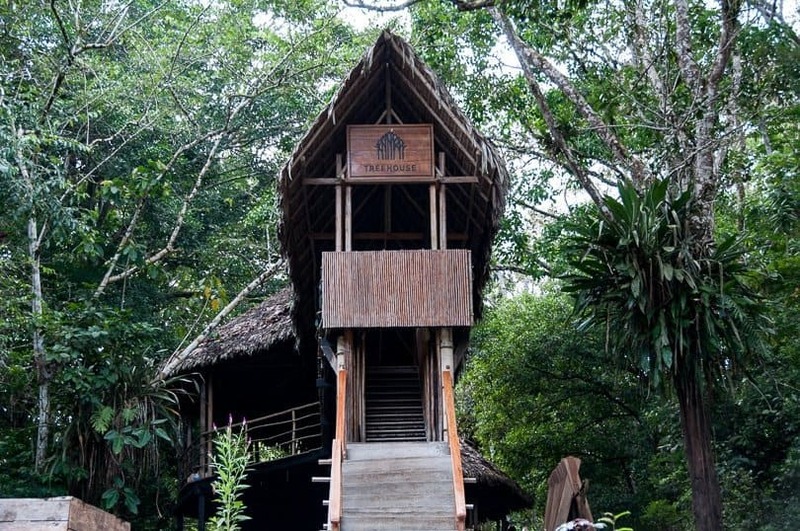 Our all-inclusive tree house resort provided we needed for a superb stay in the jungle. We never had the same meal twice. Breakfast was fruit, cold meats, cheese, breads with fresh juice and coffee. It set us up nicely for a day of jungle excursions. 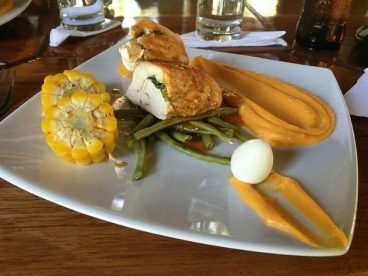 Lunch consists of a salad starter followed by a main dish of fish or chicken. 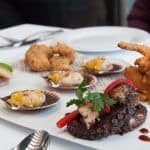 Dinner comprised of three courses; salad starter, fish, chicken or meat main course followed by dessert and all beautifully presented. 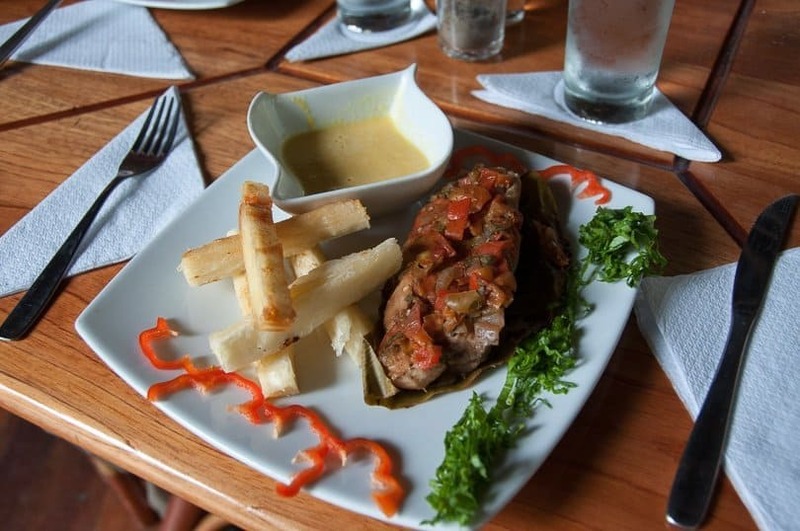 We even had fish and chips jungle-style one evening using fish we’d caught that day and chips made from Yucas root. 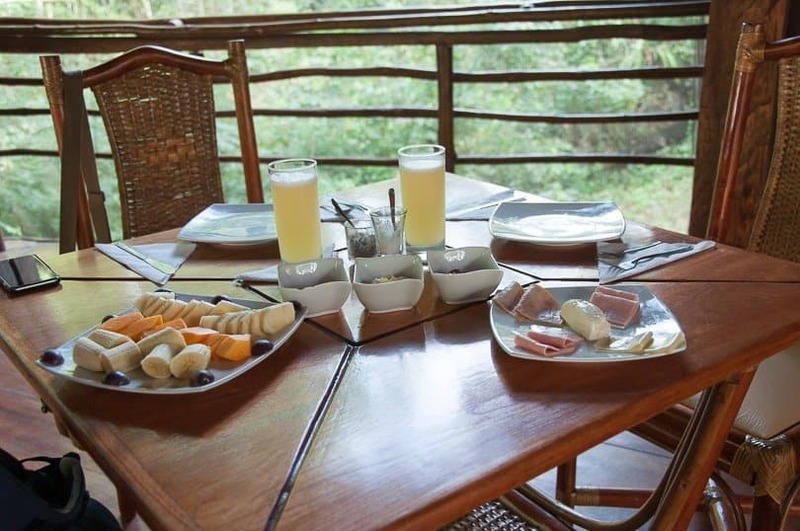 On full day excursions the lodge provides a tasty packed-lunch. Soft juices and water were provided but alcoholic beverages were an additional charge – there was a good, reasonably priced, selection at the lodge bar. All the staff in the lodge, without exception, were friendly, helpful and spoke good English. The service was excellent. Guides are English or Spanish-speaking and each treehouse has their own personal guide. This worked well and we got to know our guide, Marden, really well during our stay. He grew up in the local village and is passionate and hugely knowledgeable about the wildlife and the local area. We learnt so much from Marden. Your guide will take you out on up to three jungle excursions a day including night-time forays into the jungle to search for caymans and snakes – if you’re feeling brave. 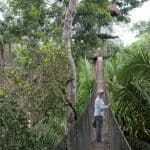 We experienced some amazing jungle excursions during our stay at Tree House Lodge. There’s a massive amount to experience on their tours. Want to hear about wild pink dolphins on The Amazon River? 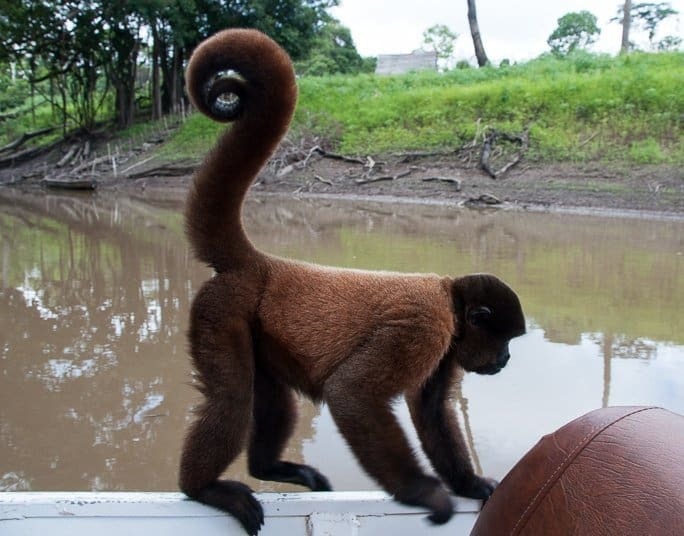 How about the time we met a sloth; spotted three different types of monkey and encountered a giant river otter? Read about our wildlife spotting adventures. Check out more of the best treehouse hotels around the world from Meg at Waking up Wild. Where’s the most unusual place you’ve stayed? Let me know in the comments below – I might have to check it out myself. Wow this place is so beautiful! It was and we made some amazing memories! It was a once in a lifetime trip! It is my dream to stay at a treehouse! 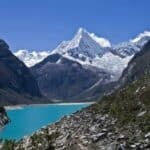 I would keep this place in mind when I visit Peru!! You should – it’s the perfect place to explore the Amazon Jungle! It was such an adventure Shikha! The anti-mozzie clothing from Ellis Brigham worked a treat – not one bite! It would be great to go back and do it all over again! Treehouse Lodge is such a cool place to stay! What an incredible location – we stayed in a treehouse on honeymoon in South Africa and it was one of the best places I’ve stayed – simple and unique. I’d worry about snakes and make sure those curtains were tucked tightly round the bed edges!! What an amazing experience! However that tarantula did it for me, I don’t think I could handle bugs that size so close by! 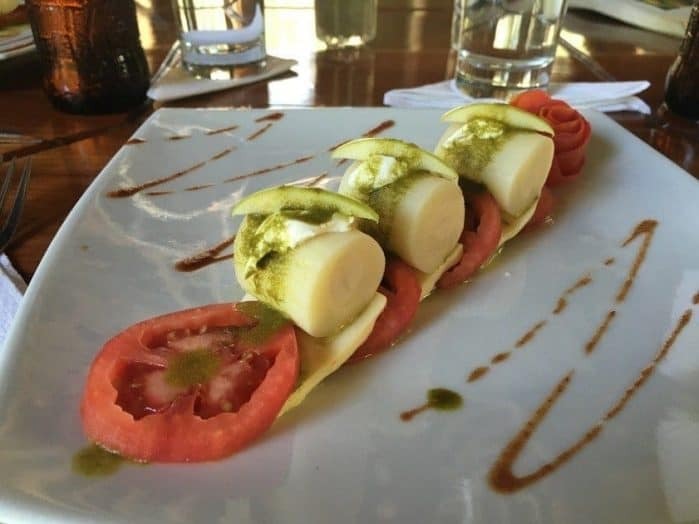 All the food looks amazing too, it looks like you had a great trip! 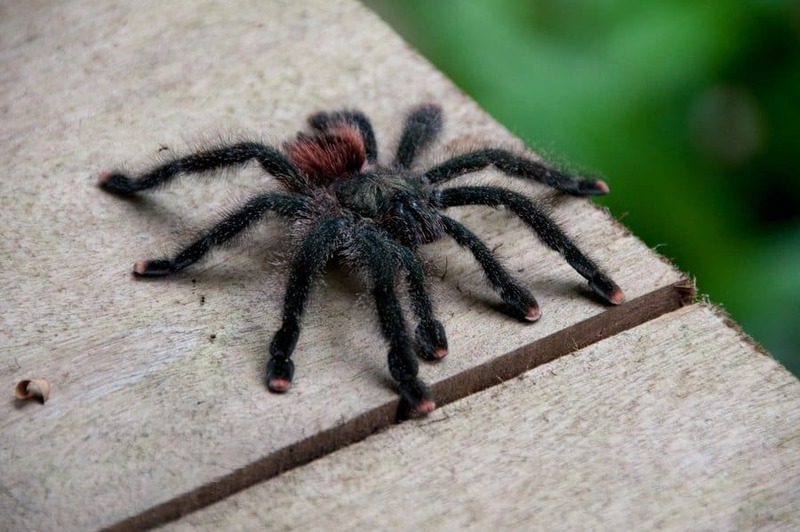 Ha ha – the tarantula was very cute and they rarely bite! 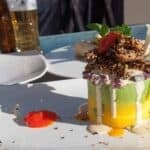 But a few bugs (and that was the really the only one) are worth the experience of a lifetime don’t you think…https://thetravelbunny.com/wp-admin/edit-comments.php#comments-form? This is just amazing! I have always had a thing for treehouses and these are spectacular! 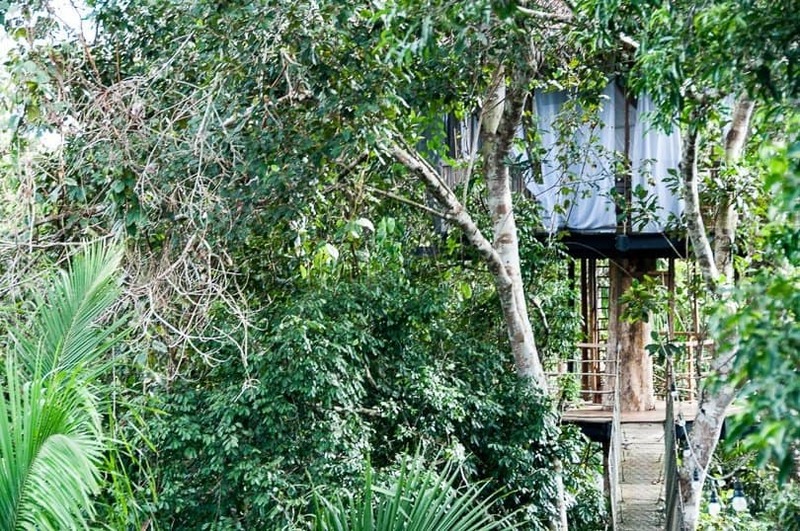 I don’t think you’ll find a better treehouse – at least not in the Amazon Jungle! 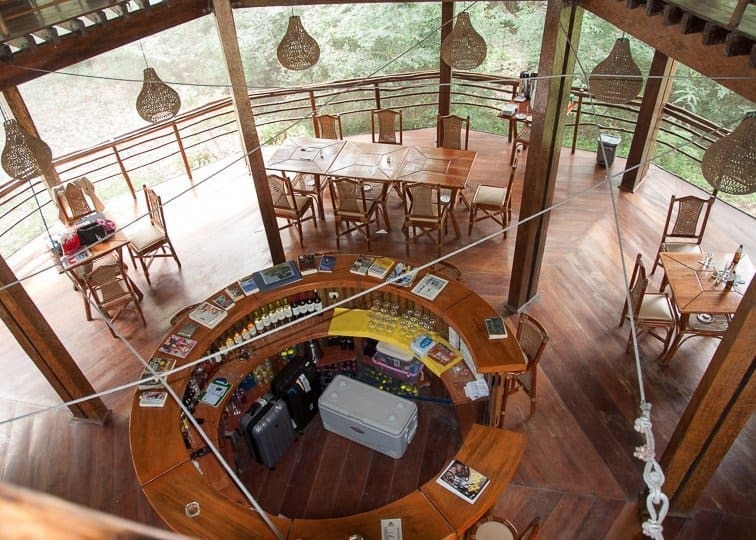 Your photos of the Treehouse Lodge look amazing! I’d love to climb up there and stay in a unique place like that when visiting Peru! I love how you mentioned it’s secluded and it would totally provide for an intimate experience! We were so secluded that we didn’t even need to drawn the curtains across which meant we could look out into the jungle the whole time. Such a good lodge…! Absolutely incredible! What an experience. Staying in a treehouse is high on my bucket list, looks like you picked a good place to do it. Looking forward to reading more about your adventures! It’s one of the more unusual places I’ve stayed in Bridget and definitely bucket-list worthy! Suzanne, I am beyond envious of you! Reading this has made me quite emotional as I missed out on an Amazonian adventure when I was in Peru in 2012. This looks unbelievable and I am now even more determined to go back and do this. Just. Totally. Awesome! What a fabulous experience (apart from the tarantula, I had to scroll past that photo pretty quick!). I stayed in a treehouse in Thailand once but it was a lot more no-frills and nowhere near as high, this looks way more exciting! We arrived in the dark so it was a bit of a shock in the morning when we realised how high we actually were. Loved looking out at all the birds flying past in the mornings and looking out for monkeys in the tree canopy. 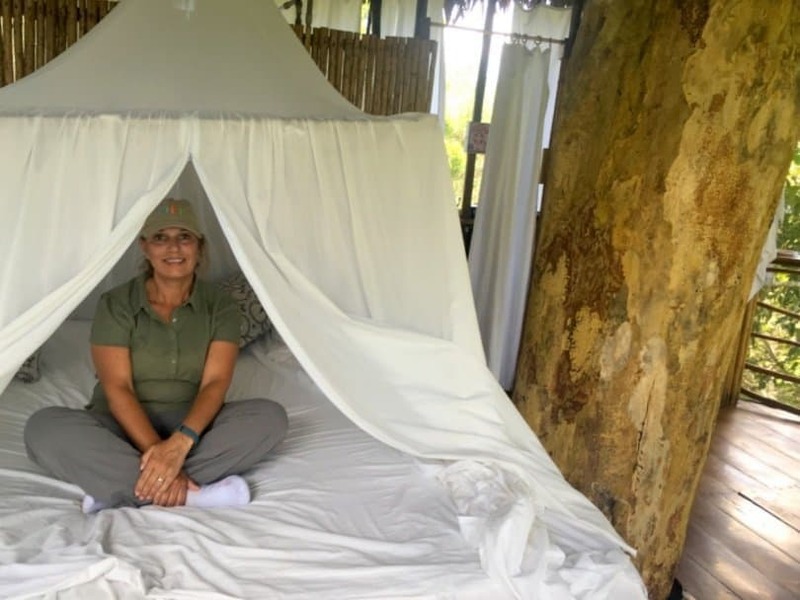 What a perfect and memorable travel experience – I’ve never stayed in a treehouse and would love to and this looks like the perfect place to do it, right in the midst of all that nature and wildlife. The nature and wildlife were my favourite part and waking up high in the tree canopy. I’ll always remember this trip, that’s for sure! What an absolutely gorgeous place to stay. I stayed in a treehouse in the Australian rainforest once and I have to admit I felt on edge the whole time about seeing gigantic spiders. You seem remarkably cool about that tarantula I would have freaked out. Honestly even the picture scared me! This really does sound like the experience of a lifetime. The walkways and stairs would test my fear of heights, although I am so much better now than I used to be. As for that spider! Crickey! I would dearly love to experience all this for myself one day. I love wildlife so I was in my element out spotting exotic birds and creatures in the jungle. 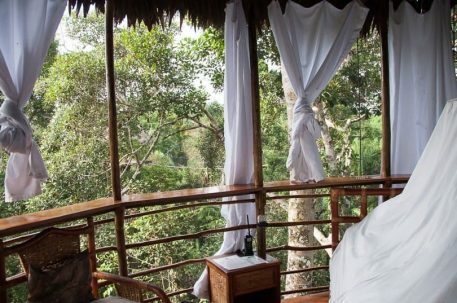 I’ll never forget laying in bed at night listening to the sounds of the jungle and waking up in the tree canopy in the morning was a magical experience. This is my type of vacation. I love the tree house and I’m sure my 3yr old would be fascinated with this as well. Thanks for sharing. Looking forward to reading about the excursions. I think there are age restrictions for safety reasons but I’m sure your boy would love going out wildlife watching on the river. It was an amazing experience. Hope you get to stay in a treehouse soon! This sounds amazing! I have been wanting to do glamping and this seems to fit that bill! It looks pretty romantic and the food looks delicious. The only downside I can see is that spider with the pedicure, would not want to run into that in my tree house. The food was really good and the treehouse so unique – we came across the spider in the jungle on the way to breakfast. Nowhere near our treehouse! That sounds like a dream come true to me. What an adventure! I LOVE the treehouse. 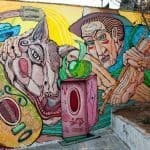 Hi Suzanne, I loved your blog about the tree house it sounds like an amazing place to stay! The photos are amazing. I can’t wait to hear about the excursions.